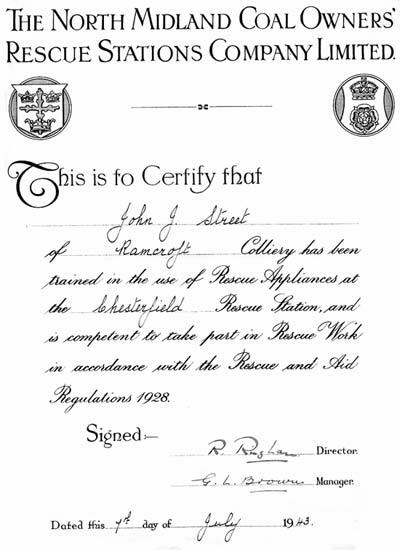 It was 1947, I was 7 years old when my father John Jeffrey Street joined the Mines Rescue Station in Mansfield Woodhouse. 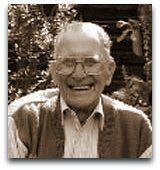 John Jeffrey Street (always called Jeff) died on the 3rd March 2005 at the age of 88. 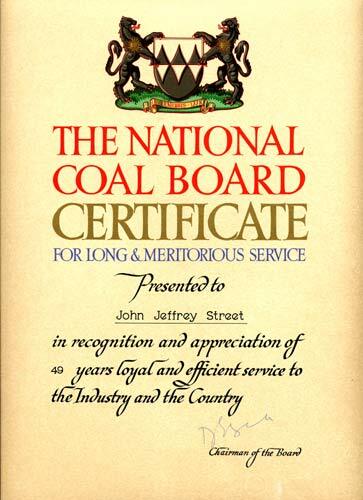 He had devoted all his working life to the Coal Industry, clocking up 49 years service before having to retire early through ill health. He started work down the mines around 1930 at the age of 14 and worked at different pits in the Derbyshire / Nottinghamshire coalfields before joining the Mines Rescue service at Mansfield in the late 1940's. He worked his way through the ranks to eventually become the Superintendent at Mansfield Mines Rescue Station. At our father's funeral on 14th March, we were totally overcome by the site of around a dozen of his old colleagues forming a guard of honour in the entrance to the chapel. They had travelled from all over the country to pay their last respects to a man, boss and friend they had laid their lives on the line with and for. Just wanted to say thank you for your wonderful website. I'm the grandson of Jeff Street , who you have a section on in the Mansfield Rescue section. It's been a joy to read through your site, a great credit to mining. I've always been passionate about mining history and loved hearing stories from Grandad. I had the fortune to live with him for a while on the rescue estate in Mansfield and remember going up to the station with him on many occasions. Your site brought back SO many memories. Grandad was a sad loss but we are all proud of him. I'm fortunate to have much of his mining memorabilia, a couple of wolf lamps, medals etc, but most of all, his deputy stick from before his rescue days. Thank you again for this amazing site. I've already used it with children in the school at which I'm a deputy head teacher in Hampshire. Hi Fionn my uncle Billy Anderson worked at the station and lived at 2 Albany drive. He took me to the station very often as I stayed at his house every weekend. Billy died in 1990 aged 56 of heart attack we were very close. I remember Jeff Street well he was a gentleman and well respected by the team. What a fantastic website really enjoyed looking and reading every piece on it.